Watch your favourite video songs and movies in video player. It supports MPEG4, H.263, 3GP, RealVideo file types. Listen to your favourite songs in music player. It supports MP3, AAC, AAC+, eAAC+, WMA, RA etc. file types. 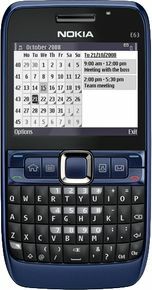 The sleek Nokia E63 offers a full QWERTY keyboard and full e-mail capabilities. The Symbian smartphone has integrated Wi-Fi, Bluetooth, and 3G support. It's also one of the more affordably priced unlocked phones. The smartphone lacks integrated GPS, and call quality could be better. The camera doesn't produce the best pictures, and there's no side-mounted volume rocker. Nokia E63 is in true sense a powerhouse. I use it as a PC and get most of the work done like PC. I use to check mails, chat,, voice chat on skype, full qwerty keyboard enables fast typing like desktop keyboard. Strong batter, strong build . It is a true companion. it is a good phone in its price range, but the processor is too slow and camera quality is poor. qwerty keyboard is very good. Good phone. It has everything leaving good camera else it is very nice. It has reaplayer, printer, Office editor, dictionary many more tools which always useful. Only camera is the bad point else is Ok. Deleting or marking things simultaneously is very difficult.